The standard registration deadline is Friday, October 3. Late registrations will be accepted for a $20 fee until Friday, October 10. Homecoming registration is $5 and includes: Dinner Friday Night before the parade, admission to the game if you march with the NUMBALUMS and/or play in the stands, and a NUMBALUMS button. All NUMBALUMS must bring or purchase a black cap to wear while marching and in the stands. You can use a cap from a previous year, buy one in the brand-spankin'-new NUMBALUMS Shop, or buy one with your registration. The hats will also be sold on a first-come, first-served basis before rehearsal on Friday and Saturday of Homecoming ($15, cash or check only). Flip folders are not currently sold through the NUMBALUMS Shop but will be available in limited quantities on Friday and Saturday of Homecoming ($12 for flute, $5 for all other instruments, cash or check only). Do I have to be an active member? 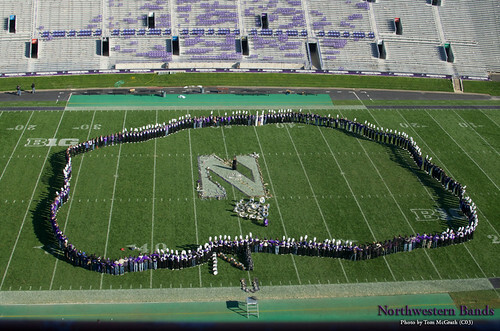 If you participated in NUMB or NUBB for one full season or participated in a Northwestern Band for three full quarters, you already are a NUMBALUM, of course! However, only active (that is, dues-paying) members can attend events, including Homecoming. If you haven't attended a NUMBALUMS event or paid dues in the past 12 months, and you're not already on a multi-year membership plan, please use this opportunity to renew your membership. When you register, choose the "Non-member" option and your $20 dues will be added to your order. Can I bring guests? Where do they sit? Please do! Share the Wildcat spirit with all! You only need to register guests if they are attending the Friday dinner before the parade, the NU Archives exhibit on Saturday morning, or the Saturday dinner with NUMB. All guests must purchase their own game ticket. Family, friends, and non-marching alums are invited to sit together in the NUMBALUMS “booster block” at the Homecoming Game. Tickets are $65 each; click here for ordering information [PDF]. I have more questions! HALP! For the full schedule and more information, visit http://go.numbalums.org/2014.